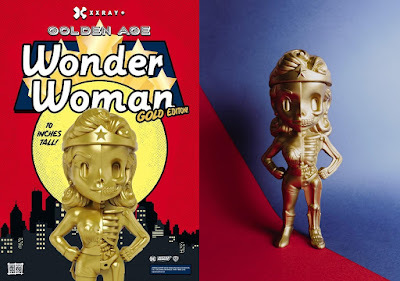 Following their huge success at San Diego Comic-Con 2018 last summer, FYE will be setting up shop at New York Comic Con 2018 next weekend where they will be releasing some really cool convention exclusive designer art figures! One of those NYCC 2018 exclusives is this awesome New York Comic Con 2018 Exclusive Golden Age Wonder Woman Gold Edition XXRAY Vinyl Figure by Jason Freeny and Mighty Jaxx. 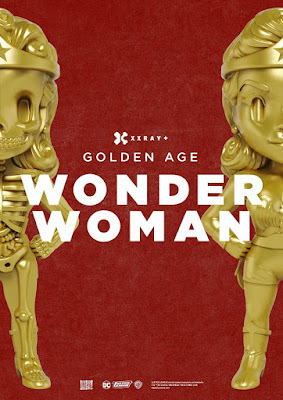 This super sized version of the Gold Age Wonder Woman XXRAY figure stands 10” tall and features Freeny’s signature dissected look with a metallic gold finish. Fans can purchase this limited edition exclusive at the FYE NYCC booth #622 or the FYE online store for $99.99.